Dell fully unveiled their Adamo laptop and it appears to fit somewhere between the Voodoo Envy 133 and MacBook Air with a 1.2 GHz Core 2 Duo processor, 128-gigabyte SSD and .65-inch thickness. At .65-inches, the Adamo is one of the thinnest laptops ever, sitting five-hundredths of an inch closer to the ground than the Envy (.7"). But at 4 pounds, it's heavier than both the Air (3 pounds) and the Envy (3.4 pounds). Its machined, one-piece aluminum chassis and glass display round out the premium features found on the Adamo. The 13.4-inch Adamo has a 720p, 16:9 screen, 2-gigabytes of DDR3 RAM (max 4GB), 802.11n wi-fi, Bluetooth 2.1, and is currently rated for 5+ hours of battery life. It also has 2 USB ports+USB/eSATA combo port, and connects to DisplayPort, HDMI, VGA and DVI with optional cables. The laptop runs on the Intel Mobile 965 Express chipset, making use of GMX4500 integrated graphics for its visual juice. The use of the Core 2 Duo means that the Adamo runs Windows Home Premium (64-bit, to be exact), and will come in either white or black colorways. The $2000 configuration comes fitted with the above specs while a $2700 config comes with a 1.4 GHz processor, 4 GB RAM and an AT&T 3G WWAN card. Pre-orders will begin starting today, and the first units will ship on March 26. ROUND ROCK, Texas, March 17, 2009 – Style-minded people who place a premium on precision craftsmanship and design can now add Adamo to their list of must-have items for 2009. 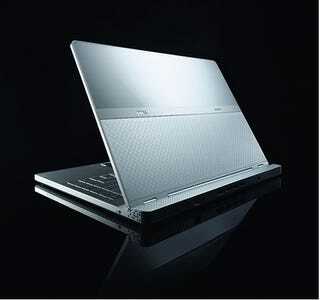 Dell today unveiled the world's thinnest* laptop as a kick off to the new Adamo by Dell brand. Adamo, derived from the Latin word meaning "to fall in love," will serve as a flagship in a line of products created to disrupt the personal computing space with the combination of new design aesthetics, personalization choices and sought-after technologies. "Great design needs to be timeless and evoke emotion in people", said Alex Gruzen, senior vice president of Dell's consumer products. "While a premium computing experience was assumed for Adamo, the intent was for people to see, touch and explore Adamo and be rewarded by the select materials and craftsmanship you would expect in a fine watch." "Dell continues to signal a commitment to design and personalization across its entire product line and has made significant strides forward in the past year," said Rob Enderle, Principal Analyst, Enderle Group. "The Adamo laptop is a showcase for this commitment and a flagship product that will draw buyers to the brand." The Adamo by Dell brand is being supported by innovative and new approaches to marketing and promotion for Dell. Designed to challenge people's perceptions of what a computer is, the Adamo by Dell brand was inspired by fashion, luxury brands and timeless design. * A stylish worldwide print campaign shot by acclaimed British-based photographer Nadav Kandar and featuring high-fashion models that reinforces the "fall in love" positioning. Kander, whose work is celebrated in galleries worldwide, also shot the moving portfolio, "Obama's People," which appeared in The New York Times Magazine earlier this year. * Artful packaging in which the product arrives "floating" in a clear box with minimal clutter - a beautiful experience for a sophisticated product. Available for pre-order today at www.adamobydell.com and shipping worldwide starting March 26, 2009, Adamo will be available online for purchase in 24 countries including U.S., Canada, Mexico, Brazil, U.K. France, Germany, Ireland, Italy, Netherlands, Spain, Russia, Sweden, Switzerland, UAE, ANZ, China, Honk Kong, India, Korea, Malaysia/Singapore, Japan, and Indonesia.